About us - Sport Club for Integration (S.C.I.) "Vitosha"
So far the club has organized 8 global tournaments and many chess competitions. The goalball Vitosha team participates regularly in all national and most international tournaments. Vitosha tam players are the backbone of Bulgarian National Goalball team. 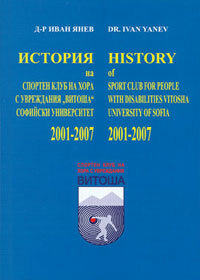 In case you would like to learn more about the history of the club, please download the abstract in English of our book “History of Sport Club for Integration “Vitosha” Sofia University 2001-2007” (txt-file, 23 Kb).